God has ordained that each person should be convicted by the Holy Spirit and should then carry out restitution. He has also ordained that He alone should be the Exposer of the sins of people. No one should expose the sins of another person while carrying out restitution for himself. He must in no way allude to the sins of others. No one should in the process of carrying out restitution confess to man things that should be confessed only to God. Sins in thought should be confessed only to God. What man knows about should be confessed to man and restitution carried out. The only way to carry out restitution for sins in thought is to put on the thoughts of the Lord. This should be done in the secrecy of the heart. Restitution should not be used to ruin a life or lives. If a man committed adultery with a man’s wife, he should not go and confess it to the person for he may ruin the marriage completely. Restitution should bless people and not destroy them. We repeat that God ordained restitution to bless the offended party and not to harm him. 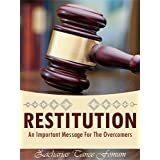 If the confessions that must accompany the restitution are likely to ruin those to whom a person wants to carry out restitution, then the process of restitution should be postponed and counsel sought. If you and some others committed a certain sin, you are to carry out restitution as if you sinned all alone. This is imperative. It is relieving to confess one’s sin to someone. We recommend this strongly. However, there are some sins that should be confessed to another person and not to the person who is directly affected by the sin. Again, we strongly recommend that spiritual counsel should be sought if the situation is delicate. The flesh will stand in the way of restitution. No one should hold back from restitution because of his flesh. Let such a one go ahead and restitute and see the death, in experience, of the flesh. Always ask, “Who will be blessed by this restitution?” If no one else will be blessed apart from you, then it is not restitution. Also ask, “Who will be hurt by this restitution?” If the party being restituted to would be hurt, then it is no restitution. God bless and lead you.